At the height of film photography the color amateur picture was mostly 10 x 15 cm (4 x 5 inches) on matte or glossy paper. The B & W photo persisted with the most enthusiastic on papers from Kodak, Agfa, Ilford and a few other brands. Even professionals used basically the same processes with bigger sizes and more control. Today, when the analogue photography market has once again become a niche, we are witnessing the interesting effect of amateur and professional photographers who turn to the almost two hundred years photography history in search of ways to make images by methods they can perform without the support of a powerful industry. The post-massification attempts to remember how it was during the pre-massification, because at the base, the situation is the same: the photographer no longer has a cheap and standardized method for his production. Yes, of course, in digital photography, on the contrary, there is a huge convergence, everything looks and everything resembles, including the images. Many people love it because without knowing anything other than pushing the button they can make professional-looking photographs. It is George Eastman’s dream continued in technology that knocked down the giant he made to be born. Meanwhile, in analogue, we have a new beginning in other bases, the photographer is somehow lonelier, a little more free, groping, experimenting, rediscovering photography. 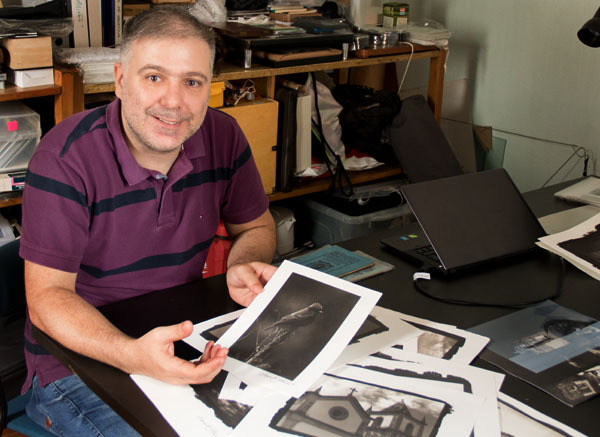 Leonardo Bittencourt is a professional photographer, printer, lives and works in Itajaí, Santa Catarina, Brasil. I attended one of his workshops held in São Paulo at Imagineiro. 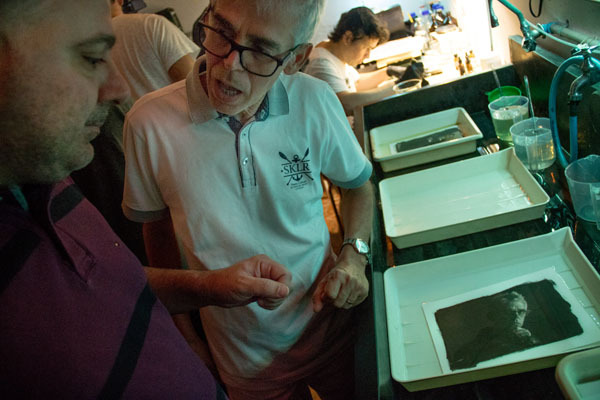 In this article we will talk about the platinum/palladium printing process based on what I saw in the workshop and talks I had with Leonardo. “Platinum” is a fine example of fruitful things coming out of the analogue photographic industry shrinking. Virtually forgotten, this technique plenty of virtues, is again very attractive, both by the process that by itself is very pleasing, as by the excellent results it produces. A short introduction about the origins. During the nineteenth century, with the dissemination of photographic images through daguerreotypes, calotypes, collodion and others, initiated basically in the 40s and 50s, the production of optical apparatus, cameras and the chemical recording of images, concerned also the photographers themselves – both professionals and amateurs. There was not the separation we have today between an industry that manufactures equipment and consumables and photographers who use them. Just as an example, Lerebours and his partner Secretan were makers of lenses and other optical instruments in Paris in the 1940s, and at the same time were recognized daguerreotype makers. According to Eder, “Their studio was opened about 1845, and it flourished for several years. In 1850 Lerebours and Secretan made one of the most excellent panoramic daguerreotypes of a view of Paris ever made” Gustave Le Gray is another example of a photographer who developed photographic techniques, in his case on chemical processes, and even had a quarrel with Archer over the primacy in collodion printing. There was a lot of experimentation and people did not feel intimidated to develop their own techniques even in very specialized subjects. More often than not, that was pure dilettantism and without much scientific basis, usually guided only by trial and error. The printing method known as platinotype was invented in 1873 by English William Willis (1841-1923). The oldest son of a renowned engraver, Willian Willis was a mechanic technician, but he worked also in a bank, a career in finance in which he rose rapidly. But he left that behind to join his father and work on new printing methods. He received then, as a farewell gift from his coworkers, a collection of books in chemistry. Despite the published patent, the process still needed many improvements and only in 1879 did he achieve anything commercially viable and founded the Platinotype Company. The idea of ​​using precious metals such as platinum in combination with ferrous salts came from another Englishman, John Herschel (1792-1871), already in the 1940s, but it was with William Willis that the process became a reality in practice. “His first patent, granted in I873, carried the curious title: “Perfection in the Photomechanical Process.” The mat surface, the neutral black tone, the extraordinary permanence of the image, consisting of precious metal, brought many supporters to this process; further improvements, such as the sepia platinum prints and cold development [at the beginning it had to be hot], were patented in 1878 and 1880. 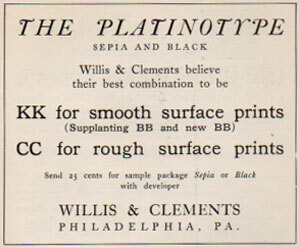 The Platinotype Co., founded by Willis, manufactured platinum papers for the trade and was most successful in maintaining their uniform quality. In later years, when the high price of platinum caused difficulties, Willis worked out two similar processes, satista paper, a silver-platinum paper, and palladiotype paper, of which the substance of the image consisted of palladium”(Eder). 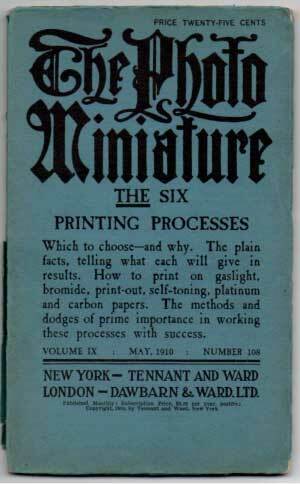 The American magazine The Photo Miniature, May 1910, was dedicated to the “Six printing processes” most widespread in its time. It mentions the abandoning the albumen, “as good as forgotten”, and lists commercially available processes. The turn of the twentieth century marked the definitive transition of the photographer dominating the whole process of his art to the beginning of a dependency of a specialized industry providing papers, films and chemicals ready to use. Kodak is the most remembered, because of the proportions it took, but there were hundreds of manufacturers established by those times. Specialized media, which were extremely important in shaping the consumer and professional markets, was supported by these companies as advertisers, and certainly contributed to discouraged the “do-it-yourself” and stimulated the ease and efficiency of industrialized products. On the front page we read: “Twenty years ago, when photography was not a popular pastime but a mysterious hobby, a photograph could be only one definite thing, namely – a so-called silver or albumen print. […] True, at that time, endless other processes were constantly coming up and finding favor for a time with the amateur workers of those days, whose chief delight appears to have been in the methods by which certain result was obtained more than in the result itself”. This observation is very revealing because it marks a change of mentality. The massification of photography was only possible when the photographer stopped being a kind of artisan of the image to become a consumer of photographic products. Development Papers. When exposed to light do not present the image immediately. The image becomes visible only after going through a development bath that will blacken the parts that were most exposed. Print-Out Papers. The action of light fully develops the image without the need for proper development. It is just fixed and washed but usually gets much better with the use of some toner. They usually yield warm black or even sepia tones. These papers require a very large amount of light and were normally exposed to daylight – rich in UV. Among Development Papers, the article in The Photo Miniature identifies yet two subgroups. First, there was the Gaslight Paper, in which the gelatin was impregnated with Silver Chloride. Also Silver Chloride Gelatin Paper would be a denomination used for that category. But the most commonly used name, Gaslight, comes from the fact that this new emulsion allowed printing with gas light or, when available, electric light. However, besides the very much increased sensitivity compared to albumen or collodion, it still did not allow the use of enlargers and prints were made by contact. Enlargement became possible with the invention of the second group in the development papers category, the Silver Bromide Gelatin Papers, much faster, quickly became industry standard. The Print-Out Papers were also divided into two groups according to the medium where the light-sensitive silver salts were dispersed: gelatin or collodion. The first is generically referred to as P.O.P from Print Out Paper, and the second C.C (Collodion-Chloride). The main differences between the two subgroups would be in the textures and finish, aspects of tact, body and appearance. Development paper – silver chloride gelatine paper (Gaslight). It allows copying by contact in artificial light and needs a developer. Development paper – silver bromide gelatin paper. It allows copying by contact or magnifier with artificial light and it needs a developer. 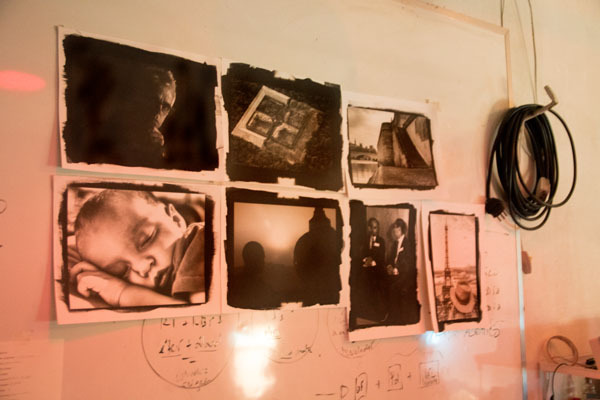 Print-Out-Paper – based on collodion. Image is developed by the action of light only. Usually uses a toner. Print-Out-Paper – based on gelatin. Image is developed by the action of light only. Usually uses a toner. The last two processes presented are Platinum Printing and The Carbon Process. 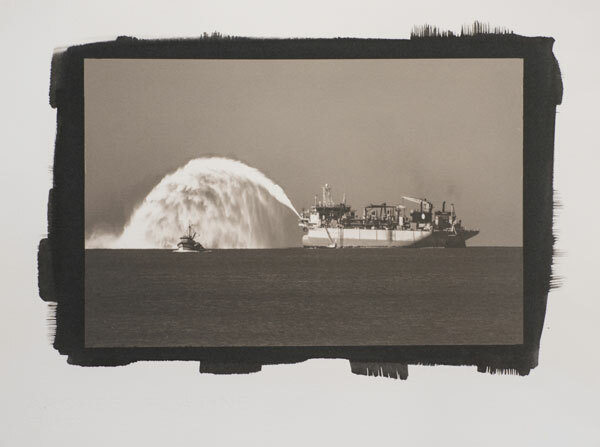 They are placed as the nec plus ultra of photographic printing processes. “We may rightly call carbon and platinum printing processes de luxe, and for several reasons. First, their results are as lasting as a photograph can be. Indeed this is not doing justice to them. They rank equally with etching and mezzotints in their absolute permanence. Further, their quality (if the negative is the best, and that is a big IF) is something beyond that of the other processes at their best”. 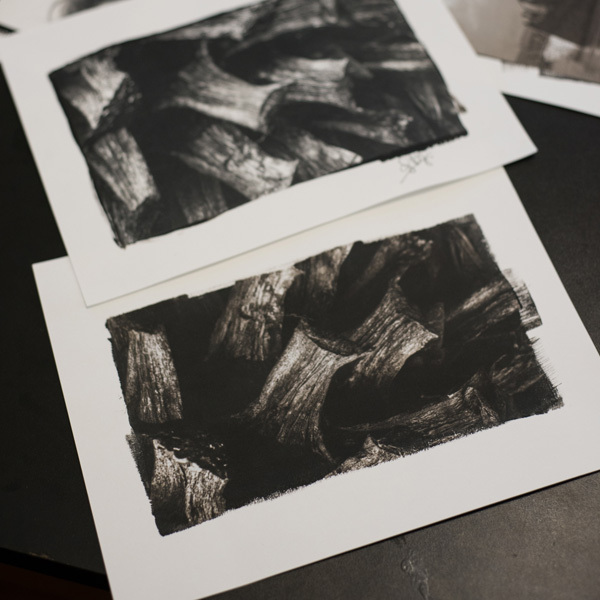 Carbon Print starts without the usual white paper, instead it is made with a paper covered with gelatin and black (or colored) pigment, sensitized by a solution of dichromate. In exposure by negative contact with UV rays (sunlight was the rule) nothing is blackened as in the case of metallic salts, instead the transparent areas of the negative transmit more light and this makes these areas “hardened” in the copy , insoluble in water. 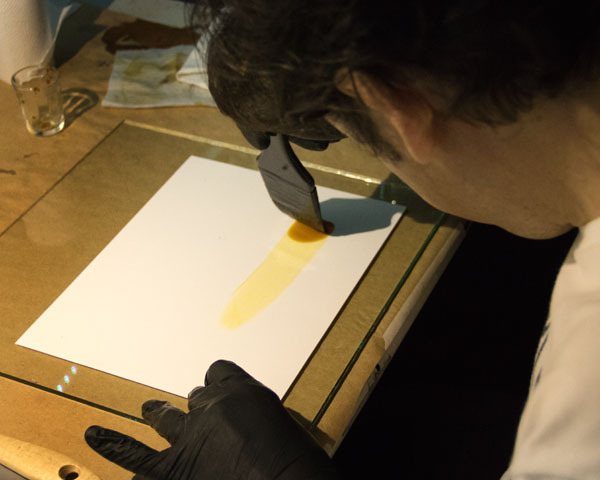 After exposure, simply wash the copy and any part that has not received much light will dissolve revealing the paper white, while in shadows, the insoluble dichromate layer, will produce grays and even deep black. The end result is therefore paper, gelatin and pigment. Three elements that are very stable and from this results the longevity of this type of printing. The question of permanence as a consequence of the use of platinum has already been mentioned. That would be nothing if durability were for a flat, lifeless image. 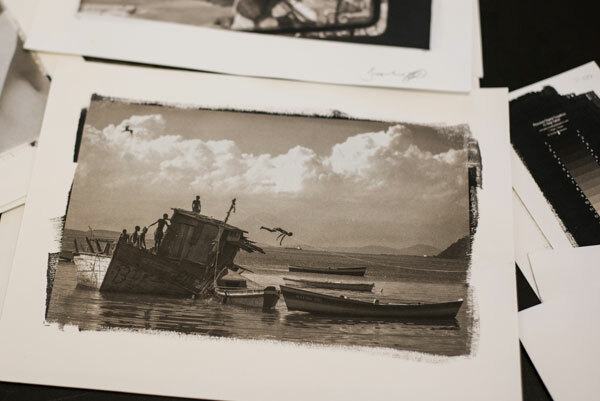 But a platinum print made from a negative that makes good use of its qualities, has a tonal richness that allows us to distinguish details in both shadows and highlights. This is really distinctive as we are not accustomed to see such an effect in other regular prints. In addition, and perhaps linked to that, there comes a question of the relationship between the support, the paper, and the means by which these different gradations of tonality present themselves. Turning to The Photo Miniature: “The papers we have been considering are all what is known as emulsion-coated, that is, the sensitive silver salts are made into a kind of semi-fluid milk, which is applied by machinery to the paper and sets as a solide sensitive coating on the surface. Not so with the platinum paper. The natural paper carries the sensitive salts in its fibers, not on the surface only”. In fact, this is a very good description of something that is sensed but not always consciously perceived. In common photographic papers there is always a noticeable separation between paper and a layer of gelatin or the like where lies the blackened silver. In platinum, it is as if the paper itself, in its mass, in its fibers, changes color from one point to another to form the image. There is nothing like a “coating” and the pure white of a photograph looks like the paper was never sensitized. Of course it’s impossible to see it any other way than holding a real platinum printing in your hands. 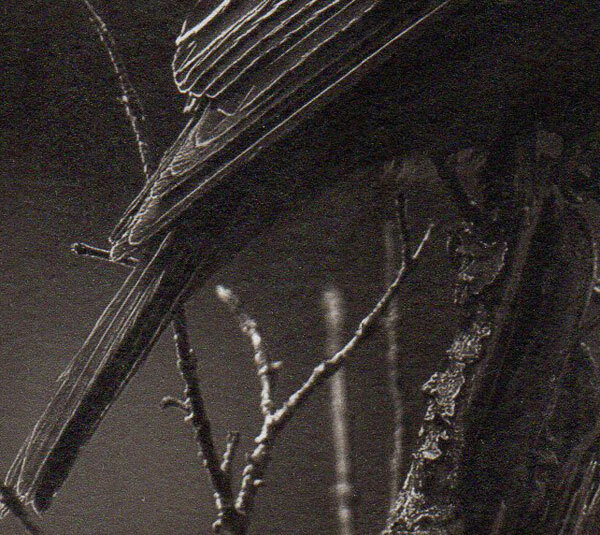 But here is a detail of a platinum printing where we can at least note how the paper texture is very noticeable. Platinotype came at a time when the more in-depth knowledge about the action of light and reaction of different substances started to be lost by the practitioners of photography . The photographers moved away from the fundamentals of the processes to register an image.. Manufacturers of papers and materials began to talk more about brands and less on physics or chemistry. Aristo, for example, was a print out paper of silver chloride / collodium, but such type information was rapidly disappearing from the communication material. 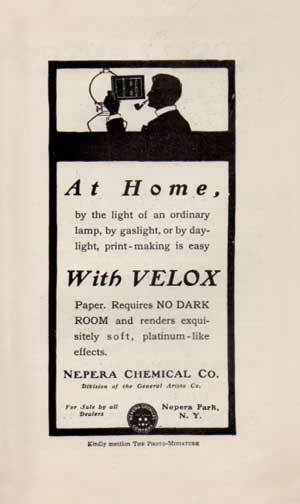 Velox was another paper of Silver Bromide on Gelatin, which was very successful. So many other brands were created and it was with these names, that do not say much, that generations of photographers were learning their trade without worrying about principles and experiments starting from primary reagents. Patents and industrial secrets completed the scenario that led to total abstraction in the technologies of making images and cameras, lenses and chemicals in photography. Today, when analog photography no longer interests big investors, we come back to the possibility of a hybrid scenario made up of small businesses marketing their chemistry, their magic potions, and photographers who review old publications and forms to try out photography from the periodic table . It is in this confusing but very lively region that workshops, discussion groups, recipes, applications, adapters and bricolages of all kinds are exchanged. Pixels are mixed with chemicals and thus an important territory is defined in the making of images in the 21st century. The idea was that of an introduction that wisely restricted the problem to a single dimension: printing itself. In this way the negative was digital and the solutions were bought as ready to use concentrated. I say wisely because it goes straight to the point of showing how beautiful platinum-type prints look with a minimum of complication, risk and investment. Once this stage is mastered and quality references / standards created under well-controlled conditions, many other possibilities open up to increase the degree of autonomy. If you want, you can go deeper by mixing some chemicals from the basic reagents. You can also use negatives made from films, you can even produce your own negatives in processes like wet plate, callotype or other. 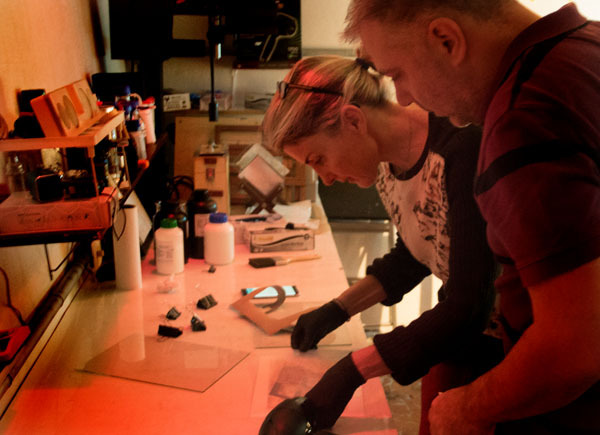 But you can also perfectly follow the process as you learned in the workshop and focus more on shooting and producing high-quality prints simply and effectively. All the material was ready and available to the participants. The paper is usually the type for watercolors. The solutions are concentrated and diluted right away before use. 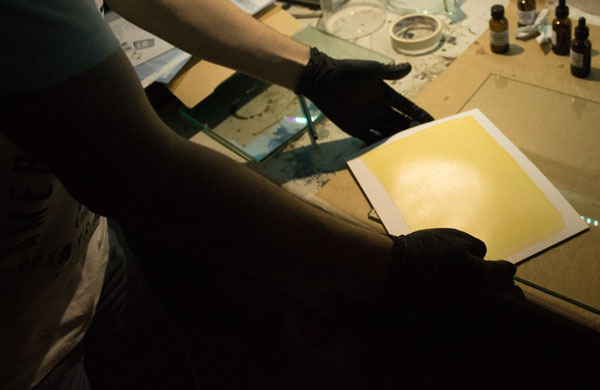 The glass can be improved when mounted on a press that holds the paper better against the negative. The UV table is good for better process control but daylight, ideally from the sun, works as well. It’s just harder to gauge how your changes during the course of the day affect exposure times. The countertop is a convenience but a sink with faucet and trays already solve the problem. Sensitization is done by uniformly applying a yellowish solution to the entire surface to be printed. Through several vertical and horizontal movements, it is not difficult to obtain a homogeneous result so that nothing is noticed of the brush marks in the middle of the photograph. 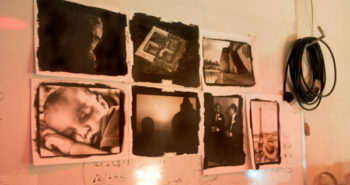 The edges are left with that irregular outline that is the hallmark of alternative processes and which most photographers prefer not to eliminate from the display copy. Gloves should be used as a precaution. 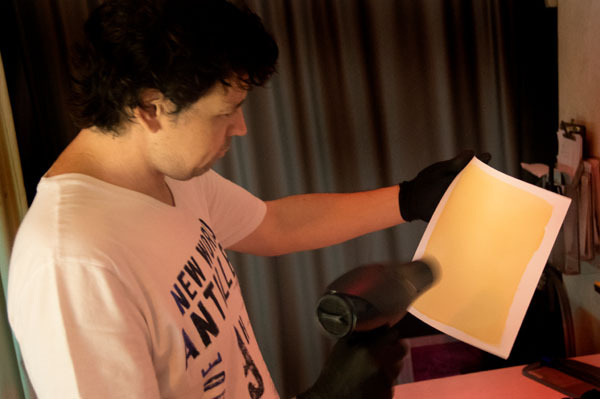 Once the coating is finished, the paper should be dried before printing. 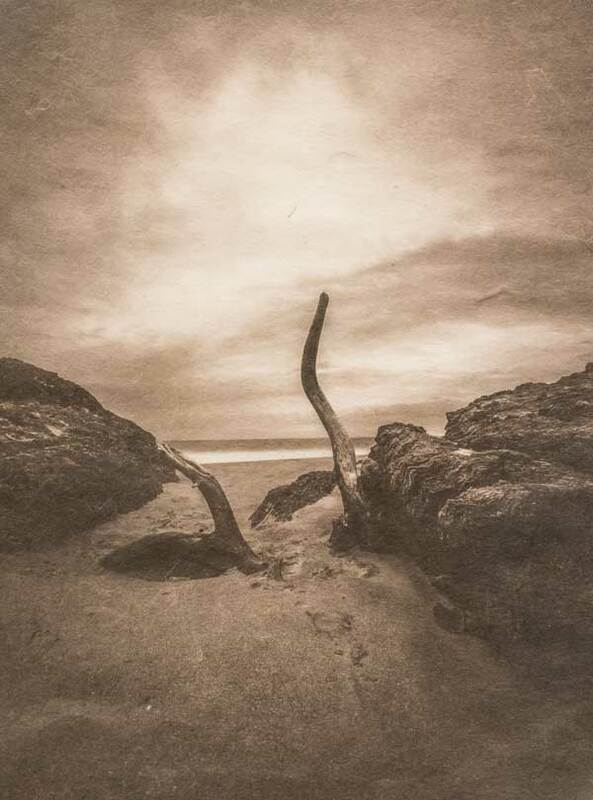 A further advantage of Platinum print over processes with gelatine is that not having a thick layer on the paper sheet there is very little curvature thereof in the drying process. Placing the negative on the sensitized paper is the next step. 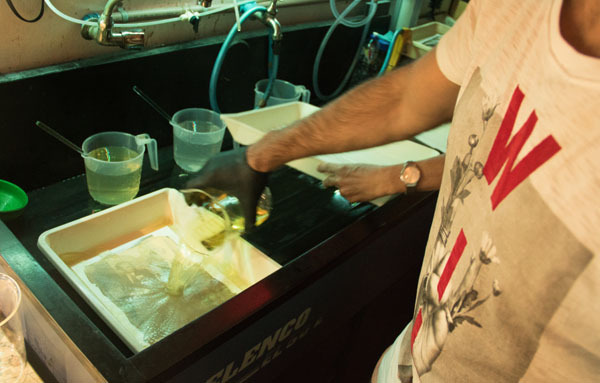 As the work is all carried out in dim light instead of the total darkness that the pan-chromatic films ask for, this operation requires a minimum of care and will be performed correctly. After that the negative sandwich with paper and glass should be exposed to UV light. That ranges from 20/30 s to minutes depending on the strength of the light source that is used. We see above, at the moment when bath processing begins, that the image is already clearly printed but the shadows still have a low density. The contrast will come over the processing on the wet bench. After that, as in every photographic process, it is necessary to eliminate sensitive material that has not been transformed by light. The terminology of development and fixing, familiar to those who have already made processes in silver, is not very suitable for platinum. It is halfway between print-out and developing papers, as we saw in The Photo Miniature. The sensitive agent is a ferrous salt, but that is not what blackens and forms the image. Once exposed it is transformed into another salt capable of releasing the platinum and/or palladium from the compound in which they are present in the sensitizer. These noble metals are the ones that actually form the image. Baths then play a role in completing this conversion and removing the ferrous salts from the paper to leave only the image formed by platinum and/or palladium. Finally, the great advantage of a workshop is the chance of discussing with an experienced printer the results you got. That saves a lot of trouble in figuring out the best practices. In general terms the copies produced on the second and last day were very good. Given that no one had previous experience with the process, some did not actually have any experience with film or any kind of photographic printing, I believe it was a great first step to build upon. 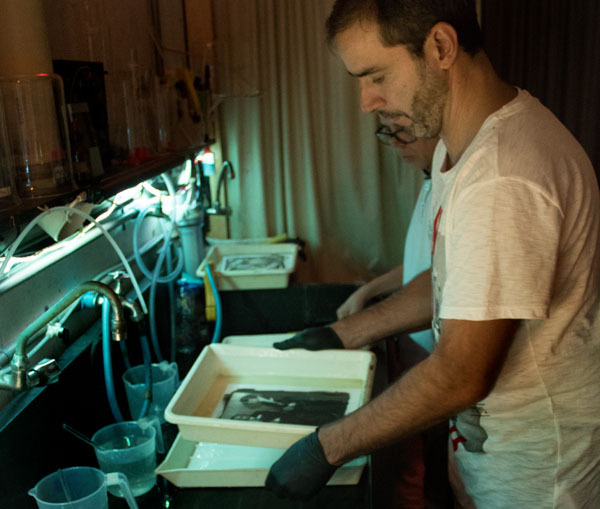 The more one knows about certain printing process, already at the moment of taking the photograph, the better he will imagine what type of printed image it can yield. It is generally very different from the scene that the photographer had before his eyes and this difference is maybe the very added value a photographer can provide. Below, more images produced by participants of this and previous wokshops. 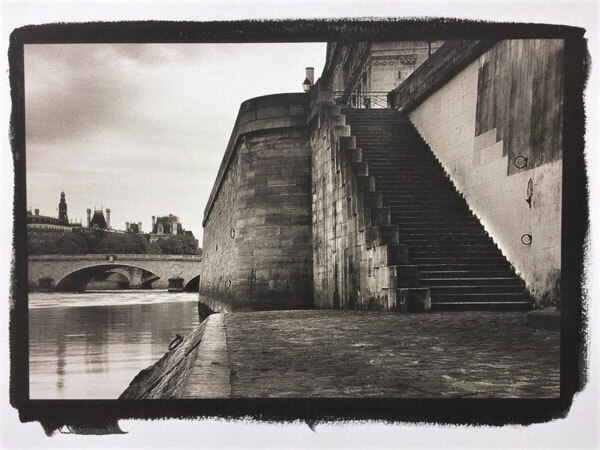 One of the interesting points to note in the photographic production of Leonardo Bittencourt is the clash between the choice of Platinum printing and some themes that are recurrent in his work. Many photographers revisiting historical processes do so as part of an attitude of reactivating a past – maybe a way of provoking the present. They tend then to a more purist attitude and seek almost ritualistically to utilize end-to-end equipment and processes of the time. This also requires the choice of subjects that can be photographed with lengthy exposures, with large-format negatives (for contact copying) with View Cameras and generally using the lens cap as a shutter. Well, it turns out that Leonardo likes to photograph birds. 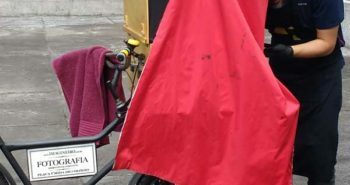 He is also working on a series about fishermen and other workers connected to the sea. These are themes in which digital mono reflexes are unbeatable. 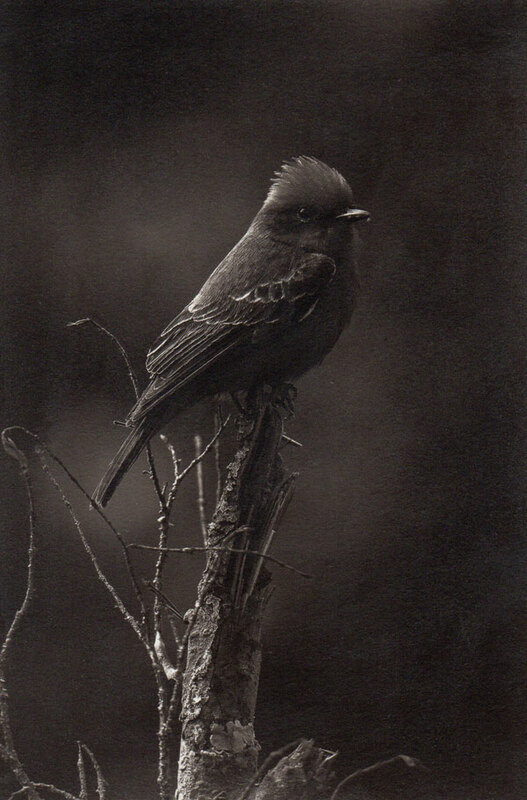 Only a confined or dead bird could be photographed with an 8 x 10 view camera. It is also true that tripods have little use in boats. 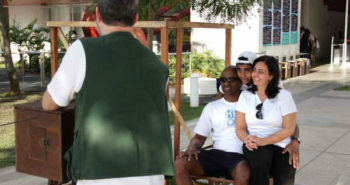 The fact that the photographer’s gaze is directed at the world and that the world is no longer as it was in the nineteenth century, creates a new situation in which subjects never visited by a printing technique, such as platinum, are suddenly within reach of a photographer due to the possibility of using hybrid processes. Leonardo notes that films and other processes for analogue negatives have been developed along with analogue print media. That is to say that the curves and sensibilities harmonized well, or they worked in a certain way that was understood as ideal in that time and so created conventions and ways of seeing. Today, when there is enormous freedom in rendering the tonal scale of an image, especially if photographed in raw, many possibilities open up to explore processes such as platinum on new foundations. This meeting of two technologies so far apart in time and nature may be one of the most interesting areas to explore in the world of images in the coming decades. The story does not repeat itself. To get in touch with Leonardo Bittencourt follow this link.